When playing songs, have you ever noticed that you often play the same groups of chords? These are ukulele chord families! It’s very common to come across songs that have the chords C, F and G, for example. That’s because those three chords belong together in the key of C, and sound good together. They are an example of ukulele chord families. They are used together in all kinds of music, from pop to classical. Even songs with many chords in the same key will still have those three chords in there somewhere. These minor chords belong in the same family as the 3 major chords above; Am, Dm and Em. If you mix up these chords and play them, you’ll find that it sounds good, and might even remind you of some songs you know. 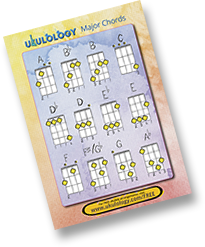 Literally thousands of songs use some or all of the 6 chords in this ukulele chord family. It’s really good to practice moving between these chords, as when you are playing songs it’s very likely that these are the changes you’ll need to play. To play in F, you only need to learn 2 new chords, Bb and Gm. The C, F and G songs you know in the key of C, can now be played in the key of F just by replacing all the C chords with F chords, every F with a Bb and each G with a C. Same song, different key! 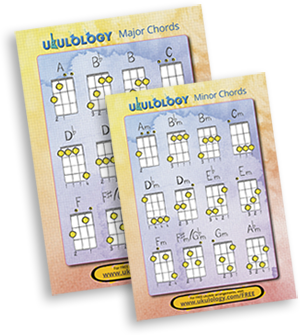 Ukulele chord families are a really good way to practise changing between chords. They are the most common changes you’ll find when playing actual songs. When learning to play in a new key, you’ll often find chords you already know from other ukulele chord families. Sometimes you only need to learn two new chords! Make your practice smart! 10 minutes of focused work on particular ukulele chord families is better than an hour of flitting from one thing to another. The more songs you play using the same ukulele chord families, the more your fingers will start to know where to go to make a particular sound. You’ll begin to hear where your fingers should go next!